I spent nine days around Mexico recently and it all started with my cousins wedding in Aguascalientes where his new wifes family is from. 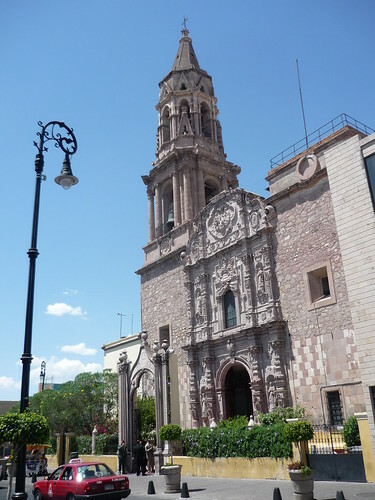 I wasn't sure what was coming as far as the city itself except for a few paragraphs summarizing some nice things about the smallest of Mexico's 32 states. 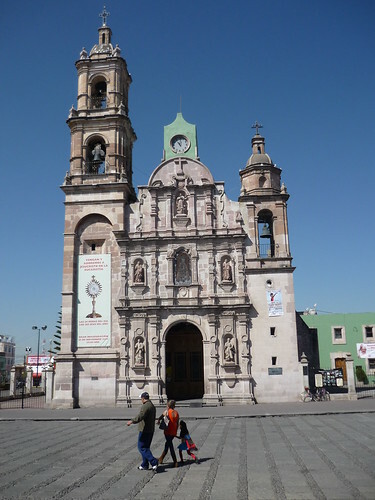 Aguascalientes is both a state and also a city within it located in NW Mexico. There are almost a million people, most of whom live near the center city. It's very old school European and you can feel the Spanish influence in the colonial structures along the sidewalks and all the old buildings while walking around. The people here are very freindly and never once did I have any type of conflict or feel threatened. 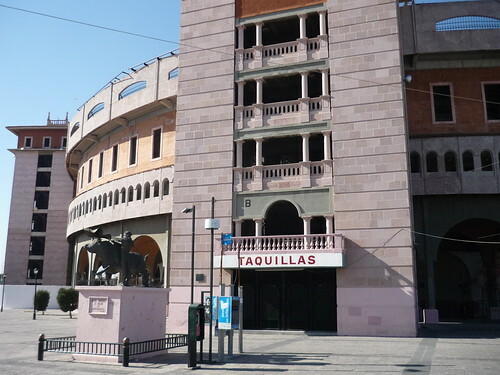 Aside from a few cab rides to a couple food spots not too far away, I generally stayed within the Plaza de Toros/San Marcos area. 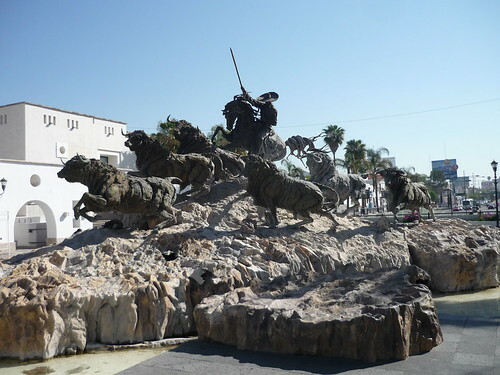 Despite there being no coastline here and the population small by Mexico standards, it's the center of the country each April and May when it hosts the annual San Marcos National Fair which attracts upwards of 7 million visitors from all over the globe. This is the country's oldest active running fair. 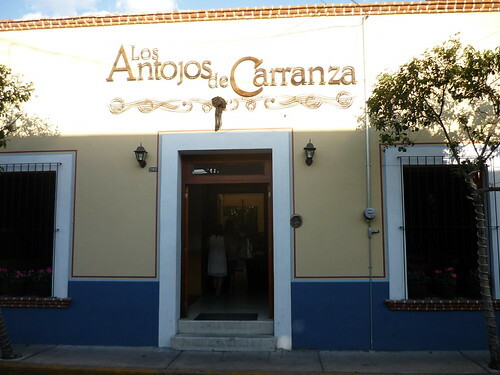 It's one of Mexico's biggest parties and goes from the early day when many events are entertainment based for the entire family into the evening with concert all the way into the early morning when the local bars and disco clubs don't even start rocking until around midnight. It's a really pretty city that you can tell is growing by the day but is still managing to keep some of its colonial charm. Aside from the fact they were building quite a few things for the fair, there was constant construction everywhere. The constructing of everything from new superstructures to houses and condos for living and the fixing streets too was happening. The fairgrounds are right in the middle of the city where we stayed which is where all the snapshots of the city I have were taken. The largest building in the area is vacant most of the year but come fair time they fill the entire block-long old school structure into a casino complete with gaming equipment and all else. 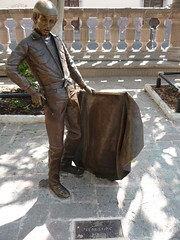 Some other attractions include the San Marcos Bullfighting Plaza which was originally built in 1896. The structure is still standing and today is used as an academy for children and teens to learn the ropes of the sport that Mexico adores. In fact bullfighting might not be any bigger anywhere else in the country than it is right here. 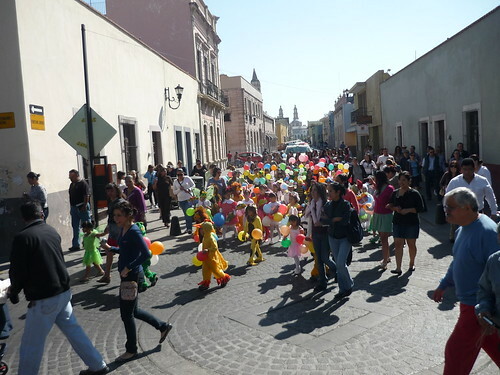 In Aguascalientes its a tradition that's been passed down thru generations. 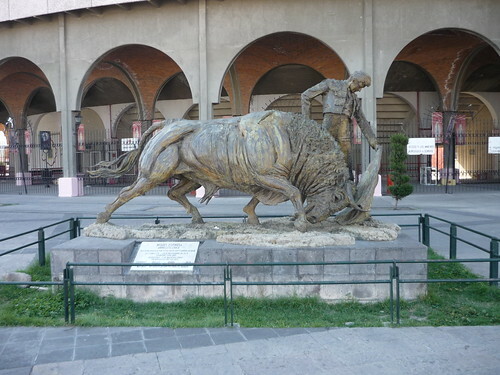 Over time the Plaza de Toros de San Marcos wasn't large enough to hold the ever growing number of visitors who travel from all places in Mexico to see the bullfighting so a new stadium arose. The Plaza de Toros Monumental is what I was told to be the largest bullfighting plaza in all of Latin America. 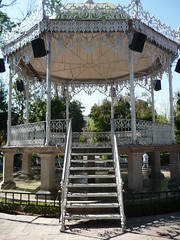 It houses over 16,000 people and has shows daily during the festival. I never knew there would be so much to do and since I had such little time to run around I didn't even get to see or eat 1/4 of what I had hoped to once I realized how vibrant of a little city this is. 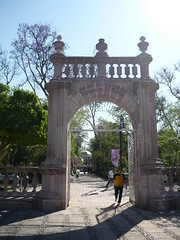 Other must see attractions (free too) include the San Marcos Garden which was as peaceful of a little walk as I've been on. Finished in 1852 it has a neoclassic feel. Walking thru here you forget that there's a bustling city just outside of you. 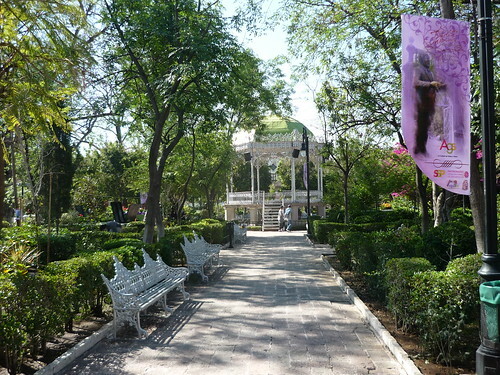 The garden, much like the rest of the San Marcos area of the city is very well kept. Every morning the first people out were those cleaning up the square. 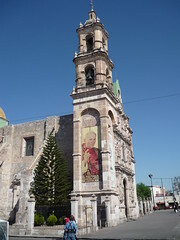 Located just to the west of the garden is the Temple of San Marcos (seen above) which construction began on in 1655. Itwent untouched for over 100 years only to later be finished in 1765. The place I really wanted to see but didn't get the chance to is visit the National Museum of Death. 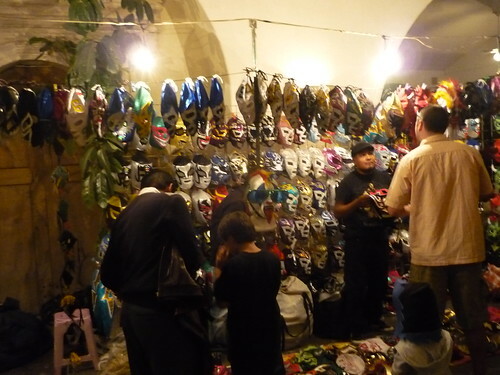 Next time I plan on visiting what has to be a pretty "sick" place given Mexico's fascination with being six feet deep. 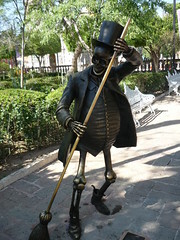 There's all sorts of skeleton statues, murals and fun goods like dolls and artwork of it for sale throughout the city. 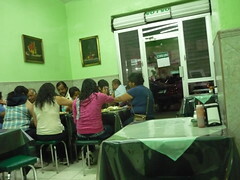 The one thing I knew before I even googled anything about Aguascalientes was that the food was going to be good. Considering the facts that Mexican has long been my favorite type of cuisine and I've never been one to shy away from street food I knew I was in for some good eats and I ate great. 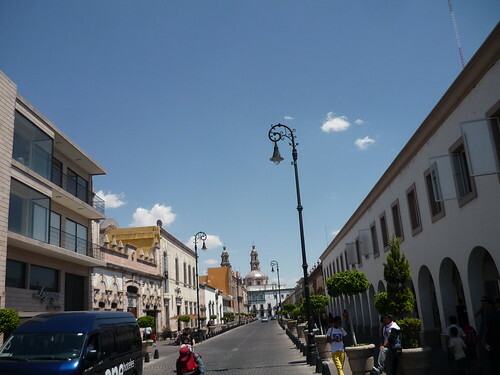 The center square near the Temple of San Marcos would have vendors in it throughout the day. During the late evening hours on Saturday the place was jam packed and filled with family and friends, singles and couples out and about for a good night. 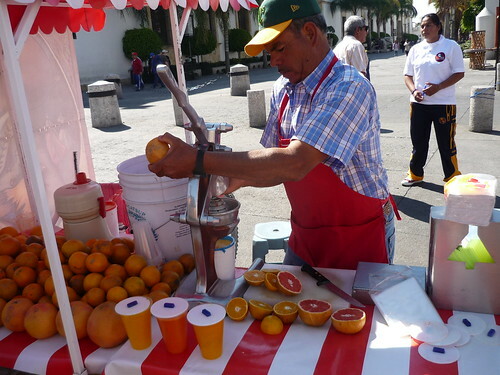 I started each morning with a fresh squeezed grapefruit juice from a nice guy who was there early each day. 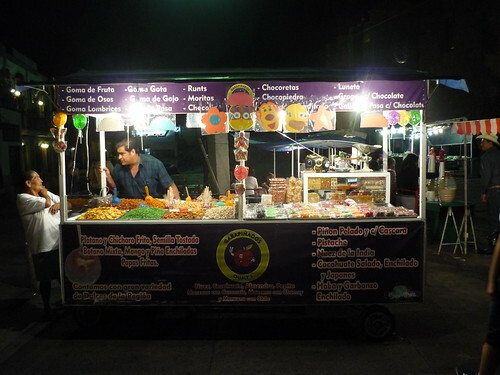 As far as the selections offered from each street cart goes, those varied greatly but each looked great. 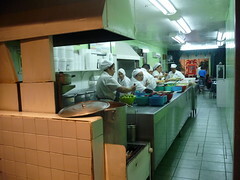 Aguas' is the center of sweets in Mexico and the guava fruit is an important part of the agriculture in this area. 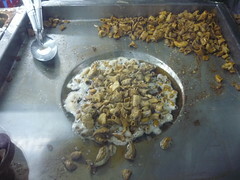 They use it for making candies and also sauces for meats and fish. I had read about a few of the regions specialty's foodwise and the dish most people kept mentioning was the San Marcos Chicken aka Pollo San Marcos which consists of "golden fried chicken prepared with chopped tomato sauce, accompanied by serrano chiles. 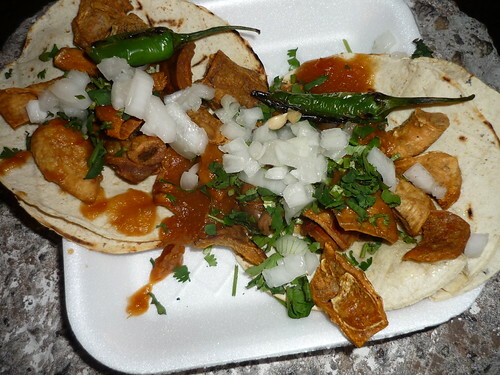 Truly a great Mexican delectable dish" unfortunately this is a street food served mainly during the festival which I will one day have to see/eat for myself. 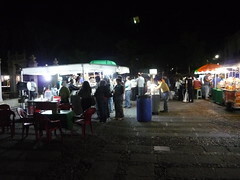 Nonetheless I still was able to chow down at a handful of sidewalk restaurants and eat some treats from vendors selling their specialties along it. 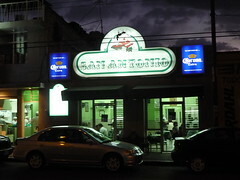 The city is full of food options ranging from the authentic local stuff to places that looked like the Mexican version of Applebee's. It's diverse here and there are immigrants from the United States, Germany, Canada, Japan and other places around the globe so you can find everything from your local Irish pub to fancy sitdown Italian restaurants and local high end Brazilian style steakhouses too. 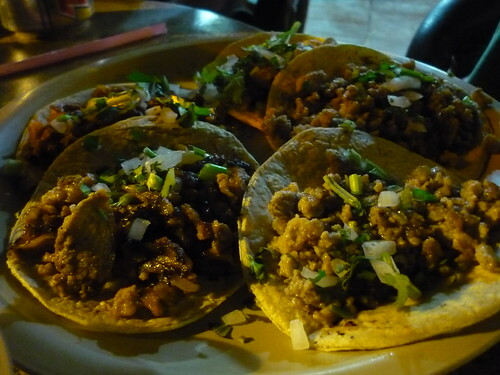 We got in late Thursday and I had some good al pastor, birria and cabeza tacos as well as gringas and gorditas which are Mexican specialties from this region. 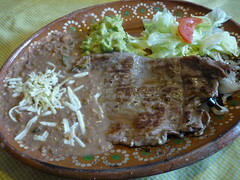 All excellent eats with an ice cold Mexican brew or Micheladas and Margaritas too. 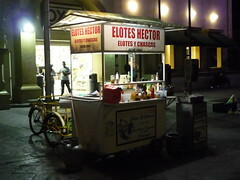 Two of my favorite eats came from the streets and just because I know some folks are wondering, no I never get close to sick, not from the food nor too much tequila. First up was this guy who I caught Friday and Saturday night when he was with his son selling his wife's family recipe for tamales oaxaquenos. 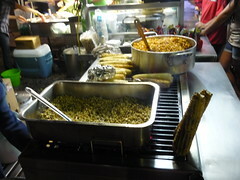 These came wrapped in the traditional banana leaf and were all masa offered with red or green sauce atop. 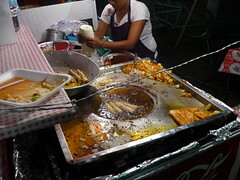 This was my favorite street eat without meat and good enough to where I seeked them out the next day too. 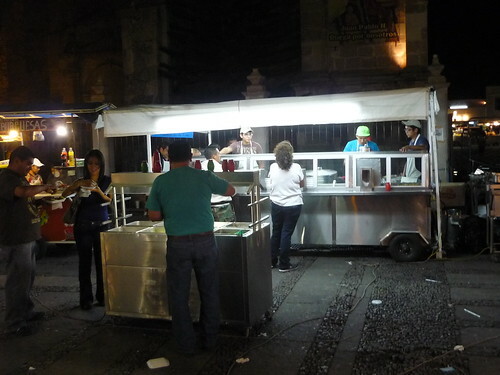 Then there was this fried insides taco stand seen below which caught my eye on Thursday night but it was after I already ate all sorts of stuff and traveled a long day so I just want to bed to rest up for what was coming. Due to the crowd of people around it at Midnight and also the smell coming from there I knew where I was headed Friday night. Except an unlucky thing happened and I forgot it was a Friday during lent in Mexico and thus my dining options that day were minimal and it cost me a few places I wanted to try. I was right back there Saturday evening after running over during the wedding reception party that night. You bet I brought some back for the intoxicated crowd to chow down. 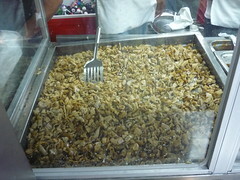 These babies were fried extra crisp and impossible to eat just one. Because of the festival and also the fact that Aguas' has a booming industry with business conventions and tourists coming in, the hotels have become abundant. 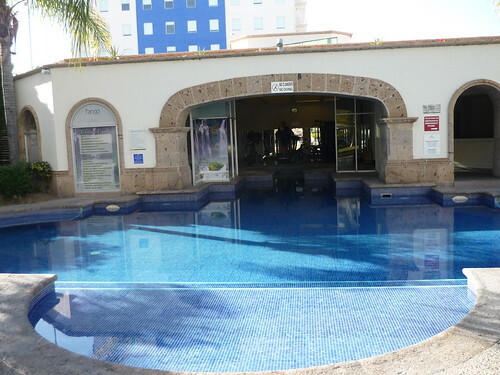 I stayed at the Hotel One which is just across the street from the Fiesta Americana where the rest of my family stayed. Both were great clean places with everything you needed to have a comfortable stay. Fiesta was a little nicer though. The reception was held at the Fiesta Americana in their garden outside by the pool with a tented area, live music and all. They did a wonderful job and if anyone by chance ever ends up staying here, make sure to go say ola to Henry at the bar. Ask him to make you up one of his mojitos made with Club Havana rum and take it over to the pool and get some sun. Since it's in the mountains Agaus' can be cool during the early morning and nighttime hours but hot during the middle of the day. The pool at the Fiesta Americana made for a nice refresher after some daytime tequila sunrisers. Early evening on Friday my cousins beautiful bride and her family had a dinner for the entire wedding party at one of their favorite restaurants. 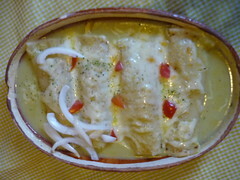 Due to the massive size there had to be a few options only and it was simple with the choice being house arrachera, verde chicken enchiladas and also a fish dish since it was a Friday. 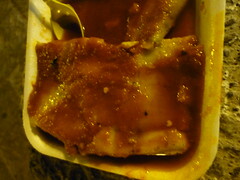 I went with the steak and also got a taste of my sisters enchiladas and both were great. The steak was tender and had nice char flavor and it was served with the best damn guacamole I've ever had. I'm sure there wasn't anything too special about it except the fact the avocados were extra ripe and the Serrano's were plenty making it refreshingly spicy. So as I already mentioned I kind of got screwed over as far as food options for Friday with many places just choosing to close down and take the day off during lent. I strolled the area around the square and abound and came across a few places that looked like my type of spots but they weren't open and this included a cab ride which I took with my mom aunt and uncle that resulted in the driver not knowing where he was going but it didn't matter anyway because this place serves not just meat, but meat in its own juice. I ended up going back on Saturday between the actual wedding and reception afterwards. It takes dedication I tell you. Yep I guess I can check this one off the bucketlist. One of the all time classic LTH threads and an example of what makes this site so great is the 'Carne en su Jugo' journey lead by PIGMON. 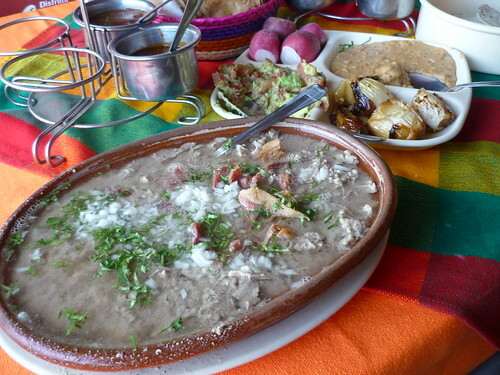 This is what turned me onto and made me love this "how can that not be good" dish that originates in the Mexican state of Jalisco. That's the one thing I did before leaving was try and find a place that might serve this steak style soup in Aguascalientes which borders the Jalisco region. Since I'm not fluent in Spanish I'm not exactly sure but I believe this place has a few locations in this region including ones in Guadalajara where I think the original is. I think I remember the menu saying they go back to 1978 at this location. Obviously I was here for the CESJ which is offered in a few sizes, of course I went large. As was the case with everything else I ate, I couldn't believe the price. 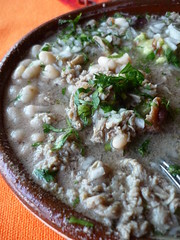 In or around $11 for the large soup and a couple beers one could of got stuffed off the chips and salsa along with the CESJ's 'side options' dish which had refried beans, guacamole, radishes, grilled knob onions and fresh onion and cilantro to do with as you please. The soup came served with only the crispy bacon on top and was a clearer like broth that I was able to confirm was homemade but that wasn't necessary anyway since I could taste it in the flavor and see the lady up front making a big pots worth for what I imagined was tomorrow. 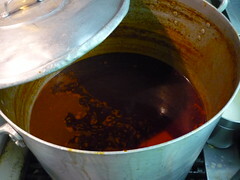 The broth was deep in beef and the steak while not the best ever was tender and nothing near chewy so it did the trick. Nice way to fill my belly up pre-wedding with an authentic experience. I didn't care that it was 90 degrees outside, it still tasted great. I also wanted to try a place right up the street from the hotel that I was recommended but they didn't have it on the menu that weekend. Next time for sure. 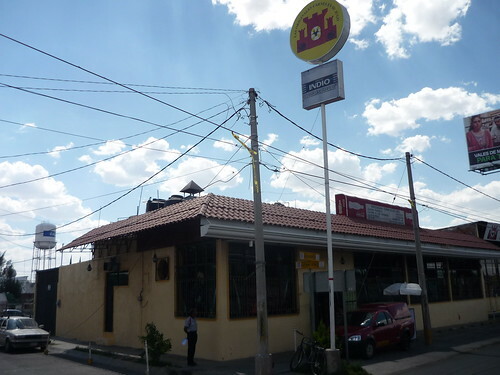 Another place that I read about and kept getting recommended was the Cenaduria San Antonio which is a Mexican style diner and cafeteria popular with the locals and families. I managed to get over here during the party later in the evening as I knew I needed some more food as I continued to drank, so I hopped in a cab and took the short ride to get some. 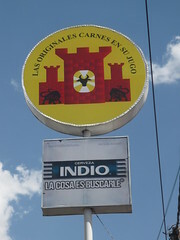 This place is known for their taco dorados estilo Aguascalientes aka flautas and also their enchiladas and tamales too. 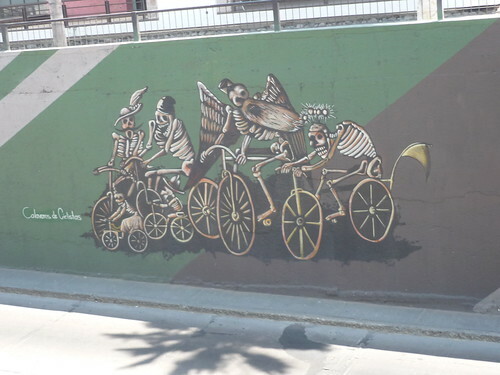 It reminded me a little bit of La Casa Del Pueblo in Pilsen. 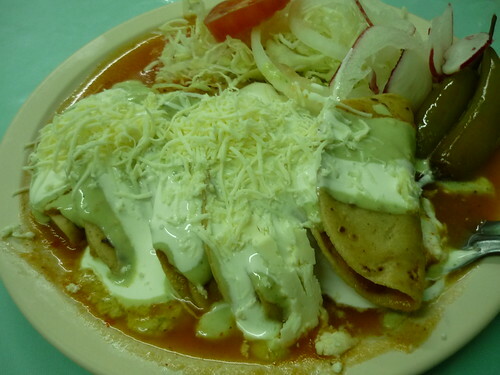 I had the flautas with everything and also got a batch of the cheese and pork tamales to take back and both were exceptional and also ample. The flautas come with potatoes and were fried to order in what I imagine was beef tallow because these were not as plain tasting as they may sound. Excellent indeed. After the wedding on Saturday night we were out bright and early Sunday morning as 35 family members and friends of my cousin loaded onto a bus and rode out to Puerto Vallarta for the week. 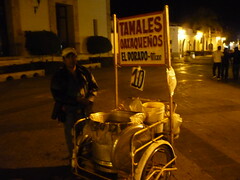 I got to stop in Guadalajara alongside a fantastic streetfood road but for the 100% safety of others left my camera on the bus. The pope was in Mexico that weekend and thus there was a week of peace called for by the cartels All that said and everything they say about peoples safety in Mexico, we were just fine. 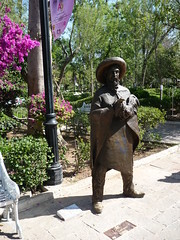 We received warm welcomes from everyone in Aguascalientes and PV. The local folks in both places were as friendly as any Caribbean island or small Midwest town I've been thru. I never felt uncomfortable or vulnerable once and I got around to more than the hotel pool. I cant wait to get back. 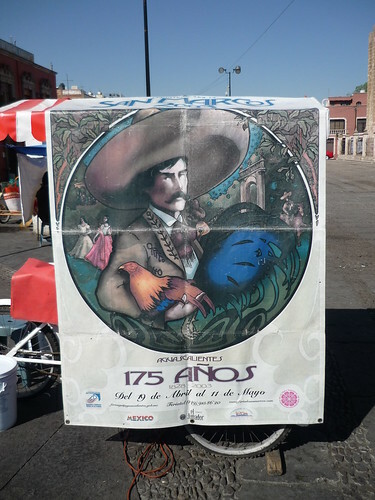 If you ever have the chance to get to Aguascalientes, particularly during the fair, I wouldn't think twice about not going. You can catch daily flights from both Dallas and Houston on American.